Intended to open up electric motoring for the mass market, Tesla’s production Model 3 has been unveiled in California ahead of going on sale in the UK in 2019. 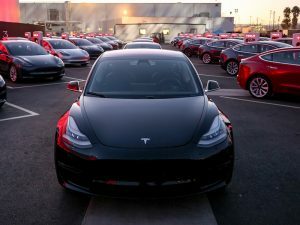 RHD deliveries of Tesla’s Model 3 – already available in the US – will start in 2019. Already starting first deliveries in the US, two versions are on offer: a standard model and a long-range battery option. Specific UK pricing and specs are yet to be announced but in the US, the standard version has a range of 220 miles according to EPA estimates, likely to bring around 280 miles on the NEDC cycle, and a top speed of 130mph with a 0-60mph time of 5.6 seconds. Meanwhile the long-range battery brings 310 miles according to EPA estimates alongside faster charging times and a top speed of 140mph with a 0-60mph time of 5.1 seconds. Prices in the US start at $35k – expected to equate to around £35k in the UK when right-hand drive versions arrive in 2019 – with basic specification including 18-inch alloys, 15-inch touchscreen display, onboard maps and navigations, voice-activated controls, keyless entry and remote climate control via the Tesla app.